To help you get the most from your visit to the Holy Ghost Cemetery, South View, Basingstoke, volunteers from the South View Conservation Group and Basingstoke Heritage Society have created a range of Walking Guides. Each walk covers a particular theme and should not take more than thirty minutes to complete. These full colour, fold out leaflets are available from the Basingstoke Discovery Centre and a number of Museum and Tourist Outlets around Basingstoke and we hope you find the online information useful. Please feel free to copy or download the Guides from this site for your personal use. Copyright 2014. South View Conservation Group. It is impossible to include all of the information about each theme in a small leaflet so there is much more information below. 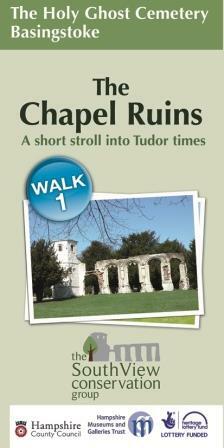 To Download and Print off your own copy of this Walking Guide to the Chapel Ruins please click on the link below. We do hope that you enjoy the Guide. The Basingstoke Heritage Society also has a general Walking Trail through the Holy Ghost Cemetery which you can find on their website here.